Di tahun 2018 ini, mari kita awali dengan hal yang sederhana, yaitu membaca contoh descriptive text pendek, singkat dan jelas. Nah pada kesempatan ini, ada beberapa contoh teks deskriptif yang dikhususkan untuk anda yang baru belajar bahasa Inggris tingkat pemula. 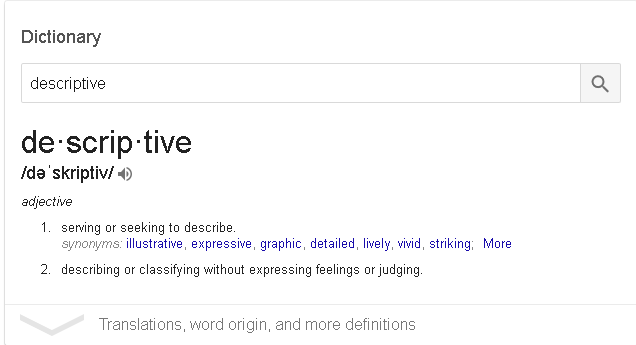 Tulisan ini adalah kumpulan contoh descriptive text singkat dan sederhana :) berisi contoh teks descriptive pendek seperty My Small House, My family, my cat, My Favourite Place, My Mother, My Friend, dan My Guitar. I live in a small house. It has five rooms: there are two bedrooms, a living room, a bathroom, and a kitchen. Indeed it is a small house; but I like living in here for wasting my spare time. When the door is open, I can see the living room. It is so small with only three chairs and a table, nothing else. I prefer reading a novel in this room. My bedroom is in the left side of the living room. In this room there is a night table next to the bed, a TV, a radio, and a computer. When being bored of reading, I usually play online games, chat with my friends via Facebook and so on. Next to my bedroom is my mother's. I do not know what is inside because I never come in to see it. In the right side of the living room there is the kitchen. In the kitchen I have everything I need when I get hungry. It is very pleasure when my mother cooks, the smell fills my whole house. I know it is a very small house; but it is the best place I have ever seen. My family has four members: those are I, my sister, and parents of course. My mother is 47 years old. Her name's Anisa. She's thin-faced and she's got long, blond hair and beautiful green eyes. She is still slim because she always tries to stay in shape. She is very good-looking, always well-dressed and elegant. My father, Lukman, is 5 years older than my mother. He is 52. In spite of his age he's still black-haired, with several grey hairs. He has bright blue eyes. He is quite tall, but a bit shorter than me. He's very hard-working. Besides that he is working in a travel company. He can even make a dinner when my mother is outside. His cooking and his meals are always very tasty as well as my mothers'. Finally, my sister Nadina. She is 22. She is also red-haired and green-eyed. She has long wavy hair and freckles. She is definitely shorter than me. She is rather introverted. But she is very sensible, smart and co-operative. Right now she is studying English and also knows Arabic and Mandarin. I want to be so smart as she is. They all, except me, speak Sundanese very well, because we were living in Bandung for 5 years. My sister have been going to primary school there. Unfortunately I was only 3 when we were leaving to Jakarta, so I can't speak Sundanese. Now we are happily living in Jakarta. My Sphynx cat is the only pet I have. He has a little hair but is not totally hairless as he has a peach fuzz over much of his body. His coat is often a warm chamois. My Sphynx has a normal cat proportion. I like his tail although my mom say that it is like a rats tail. I love his usual color varieties including, tortoiseshell, chocolate, black, blue, lilac, chocolate etc. He is really an amazing cat. Believe it or not, he is very intelligent cat. He can respond my voice commands. He is really funny as well as my friends get a joke. I love him so much as I love my mother. My mother is a beautiful person. She is not tall but not short, and she has curly hair and brown. Her eyes color are like honey and her color skin color light brown, and she has a beautiful smile. Her weight likes 120 lbs. She is a very kind person. She is very lovely, friendly, patient, and she loves to help people. I love my mom, because she is a good example to me. She loves being in the Church, and she loves sing and dance too. She is a very good child, wife and mother. She always takes care of her family. She likes her house to be clean and organized. She a very organized person, and all things in the house are in the right place. She doesn't like messes. She always has a smile on her face. She is so sweet and lovely. I like when I am going to sleep or went I wake up or when I am going to go to some places, she always give me a kiss, and when the family have a problem she always be with us to helps us and to give us all her love. Yuta is one of the 150 International students at the ELC of Brigham Young University. He is from Japan. He grew up in Japan, and he is 19 years old. There are six people in his family, a father, a mother, three sisters and himself. He is the youngest in his family. He is also the only boy in his family, but now he is in Provo, Utah, studying English. Yuta likes the United States very much and he thinks everything is cheap. Yuta thinks his English classes are excellent and the teachers are professionals. Yuta thinks someone in his class is noisy so he doesn't like that. In his free time he spends too much time sleeping, so it seems that he has a sleeping sickness. I have been in Provo for almost eleven months. I have seen winter, spring, summer, and fall. Provo's winter is so beautiful. The mountains are covered with a lot of snow. They look like many beautiful brides wearing wedding dresses, and veils. In spring, Provo doesn't have many trees; when the snow melts the mountains are bald as strong bald men. Summer in Provo is very hot in the daytime. Last summer when I was walking under the sky, it was like walking in an oven; the sun was like a fire that burned my skin. In spring and summer the weather was always clear. I never used my umbrella. Provo was like a huge clothes dryer; it is very dry in spring and summer. In the fall the weather in Provo is very strange. One late September morning when I woke up, the mountaintops was covered with snow. Provo is a lovely and strange place. I love it very much. My most valuable possession is an old, slightly warped blond guitar--the first instrument I taught myself how to play. It's nothing fancy, just a Madeira folk guitar, all scuffed and scratched and finger-printed. At the top is a bramble of copper-wound strings, each one hooked through the eye of a silver tuning key. The strings are stretched down a long, slim neck, its frets tarnished, the wood worn by years of fingers pressing chords and picking notes. The body of the Madeira is shaped like an enormous yellow pear, one that was slightly damaged in shipping. The blond wood has been chipped and gouged to gray, particularly where the pick guard fell off years ago. No, it's not a beautiful instrument, but it still lets me make music, and for that I will always treasure it. Bagaimana? sudah tahu tentang Descriptive Text? dan ingin mencoba menulis descriptive text sendiri? 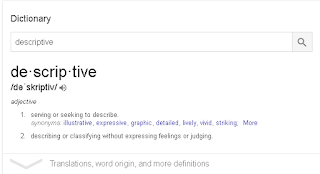 Jika tidak ada, silahkan lihat contoh descriptive pada halaman descriptive text yang memuat berbagai contoh descriptive text terlengkap. Terima kasih telah membaca tulisan ringkas ini, semoga bisa bermanfaat untuk semuanya.